IWC Mark XVI and Visconti Opera. Edited by BostonWIS, 08 March 2007 - 17:38. Swiss Army automatic pilot chronograph and Parker "51" flighter. Both my go to every day users. My everday $14.95 Benrus WalMart Special.... and a beautiful Sheaffer 1250 Balance in virtually mint condition. When you spend most of your day working with your hands, you don't buy good watches... to me a watch is a practical tool. I appreciate the look of fancy watches, but just can't see myself spending money on one... same way with pens... That might be the reason I don't own a high end fancy modern pen. OH, the fact that I am cheap might also account for this. Tom - I used to have around 10 watches, none of them super expensive (I'm also pretty cheap) but all relatively nice automatics and vintage models. I traded and bought/sold similar to pens. Then I had my first child, my now 4 yo son. I've now added another, my 5 month old daughter. Watches are generally more expensive than pens (not nearly as many Phileas, Safari, heck Snorkel or "51" priced watches) so I have now settled on 3 watches. I have the gold Hamilton that my father gave me as a high school graduation present, the chronograph pictured above, and a Seiko automatic dive watch. That along with a couple black plastic watches and most of my bases are covered. Particularly when you add in the 3 vintage pocket watches I also own (one from each of my grandfathers and one from my godfather). For a guy who was once a died in the wool WIS (Watch Idiot Savant) I have found myself wearing my Timex Ironman and Casio GShocks more than anything else - playing around with small kids and a couple dogs isn't the environment even for my Seiko - which in the watch world is generally considered an inexpensive watch! A not so good pic of the one I'm wearing today - 1963 Omega Cal. 562 Pie Pan Constellation. 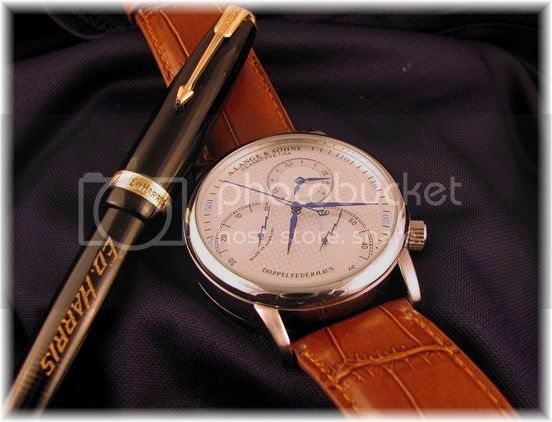 I like the idea of combining pen and watch images - I have a new digital camera that I need to evaluate for macro and that would be a great subject for test shots. 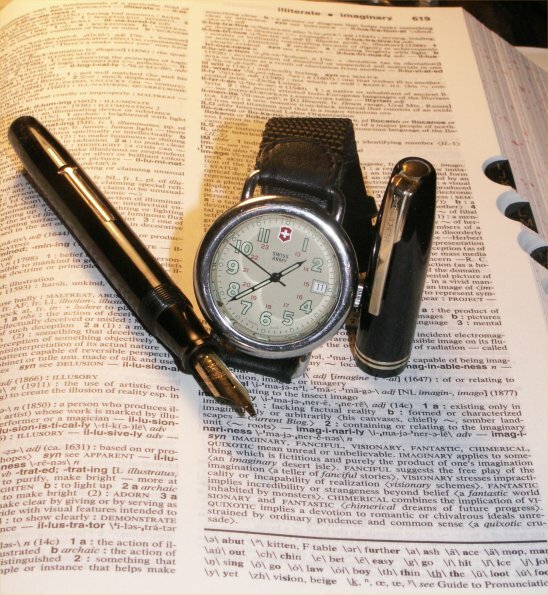 Mind you, pens are dead easy to photograph compared to watches - you need to remove the crystals on many watches to prevent glare, or use a light box to photograph them. Very nice pie pan Connie and what looks like a grains of rice bracelet! A stainless pie pan is pretty much the only watch left on my wish list - basically like yours - dagger hands and block markers (rather than arrow head). I can't tell if yours is gold capped or not, I like them both. It remains for me one of the most enduring watch designs and as far as design on a broader scale, up there with the Jaguar E type, the Parker "51" and a host of other items that I hold in high regard. Yup - I lucked onto some NOS beads of rice bands, otherwise a bit hard to come by. Had to get the watch from Spain (another ebay adventure) but was quite pleased with it - which is why I often wear it. Excuse the reflections on the watch, just a quick snapshot. The watch is a Tag Heuer which never normally leaves my wrist, the pen is a skip find Conway Stewart 27. For a number of years I used to wear a fake Tag Heuer, which I still have and it still works perfectly, as a result of that, most people who know me assume that the watch in this photo is also a fake. It's not, it's the genuine article. If only I had the money, I could get very interested in Tag Heuer watches. It doesn't really show up on the photo, but the watch face is actually a very dark green, hence photographing it with a green pen. Connie, very nice vintage Omega. I got a Vintage Omega that had the textured face and black band, it might have been a frankenwatch but I loved the face so much. It never kept good time so the seller took it back. I ended up getting a new Tag Monza for half price but while it is nice, it does not have the cachet of that vintage Omega. I would have had to spend over $200 to fix it I bet. Ill still be on the lookout. Here are a couple that I took for selling purposes on this and other boards. Wierd, I thought I had more than just those two. I have about a dozen Le Coultres but I think the Futurematic is my favourite. Great watch, andtakes very little motion to keep it wound. I prefer the black face but the white is very nise as well. The watch is my Swiss Army of the day- $10 on ebay. Pen is Waterman M something with a radically flexy broad nib- $14 at Mifflinburg,PA antique store day before yesterday. Background is Mirriam-Webster's Collegiate- Priceless. I don't know if you can see it in this picture but the song is "Hard Headed Woman" Cat Stevens borrowed from my sister- also Priceless (my sister, that is!). Edited by jackoguit, 11 July 2006 - 06:31. Out of kindness, I suppose.'" I'm a colorful kid at heart! Out of thin air, quote of the moment (6/1/06): "boredom leads to creativity, as compulsion leads to innovation"
will i be the only one with a non-analog chewtoy rubbber watch?? Hey it's a swatch I have a very very very thin swatch watch too...it's very cool! 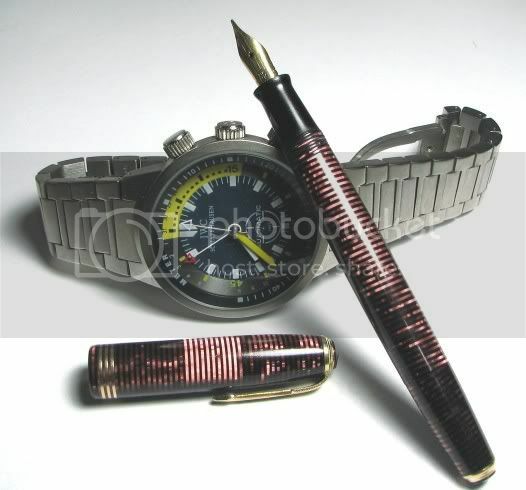 A defunct politicial campaign watch and a $2 cartridge fountain pen loaded with red ink. The only wearable timepiece I own. AND, it is right twice a day. This is unlike any politician I have known. I haven't owned a politician and am not sure if I could afford one I would want to own any now in orfice. Didn't have time to set up a flash properly, and I'm still playing with the macro on the Sony R1 (think I might like the older Minolta D7i a bit better for macro work - the depth of field is off on this shot and I should have manually set a higher f stop), but I thought that the watch on my arm and the current pen in my pocket actually made a pretty good match - an Omega Constellation Pie Pan and a Shaeffer Legacy Heritage King's Gold. Probably should have gone for a fine nib, but I'm learning to like the M in this pen and a great writer - starts right up after being left sitting uncapped for 10 minutes. Edited by wspohn, 13 July 2006 - 14:45.